Heidi’s favourite toy is a soft owl, and her favourite pastime is reading stories. So it should be no surprise that she has plenty of books about owls. There’s Owl Babies by Martin Waddell and Patrick Benson. There’s Ten Little Owls by Renee Treml. There’s The Owl and the Pussycat by Edward Lear, illustrated by Jan Brett. There’s Let’s Explore Diabetes with Owls by David Sedaris. Actually, how did that one get onto her shelf? But by far her favourite owl book is Wow! 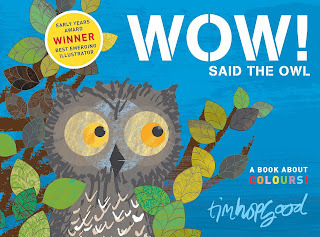 Said the Owl by Tim Hopgood. In fact, if I told her she could only keep one of her hundreds of books and we would throw the rest out, I think she would pick Wow! Said the Owl to save. And then she’d cry and I would be a terrible parent. But my point is it’s probably her favourite book of all. Here’s a recent exchange that demonstrates just how much two-year-old Heidi loves this book. Me: What does a sheep say? Me: What does a lion say? Me: What does an owl say? Wow! Said the Owl is perfect for toddlers of Heidi’s age. A curious little owl stays awake during the daytime instead of going to sleep, and discovers all the vivid colours of the world around her. On each page she says “WOW!” as she sees a new colour – the warm pink sky, the yellow sun, the green leaves on her tree, the pretty red butterflies, the grey clouds when it starts to rain. The day finishes with a rainbow, and then the little owl stays up all night, just like little owls are supposed to, and she decides that the night-time stars are the most beautiful of all. The final page, after the end of the story, shows a sort of colour wheel, and Heidi loves to point to each one and say the name of the colour – even if she calls both indigo and violet a generic “purple”. I mean, who ever uses the word “indigo” anyway? I don’t know what it is about owls that Heidi loves so much. I guess the big eyes do make them look pretty cute. The big eyes also help owls to find the mice, voles and other small mammals and birds that they like to attack with their razor-sharp talons and eat. Not so cute now, are they? Maybe that’s what the famously mysterious Twin Peaks clue meant: “The owls are not what they seem”. But back to Wow! Said the Owl. Sometimes Heidi likes reading stories on her own, and you can tell when she’s reading this one even if you're not in the room. You’ll just hear “wow” as she turns each page, then a lot of gobbledegook with the occasional name of a colour thrown in. When she gets to the page full of red butterflies, she says “owl?” – it’s the only page that doesn’t show the curious little owl. I hadn’t heard of Tim Hopgood before we picked up a copy of this book. He has a background in graphic design and uses those skills in combination with his drawing ability to produce his works. He scans the various elements, including his drawings, into his computer and assembles the images digitally. All his work starts in black and white, and he colours it using his computer – this way he can test out different colour combinations. Fascinatingly, he collects textures from unusual places – the clouds in Wow! Said the Owl have a pattern he scanned in from the inside of an envelope from his bank! What sort of creative mind comes up with that idea? Every time we read Wow! Said the Owl now – which is to say, several times a week – I’ll pay special attention to those patterned clouds and be reminded how a clever mind can see creative potential in the most mundane objects. All of this creativity combines to be a cut above your usual toddler book. In fact, it has become so popular that in 2015 Wow! Said the Owl was adapted into a stage show using puppets in London, and received rave reviews. Speaking of reviews, on the back cover of Wow! Said the Owl, you’ll see the following testimonial: “Just the right blend of vivid illustration and engaging text” – Daily Mail. For the first (and probably last) time in my life, I am forced to admit that the Daily Mail got something bang on.